Staring into a TV camera, I say, "Istanbul is one of the world's great cities, period. For thousands of years, this point, where East meets West, has been the crossroads of civilizations. 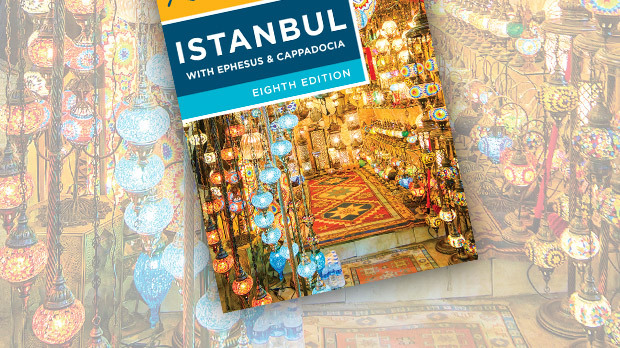 Few places on earth have seen more history than this sprawling metropolis on the Bosphorus." It's the last day of a week devoted to producing a TV show on Istanbul, and we need a grand spot for the show's opening. We had a reasonable vista from the Galata Bridge, but it just showed charming old fishermen and tour boats. I want to somehow capture both the historic crossroads and contemporary might of this city. So far, the site selection has just led to frustrations. Mentally scanning all possible angles, it hits me — we need what filmmakers call a "high-wide," a wide-angle, almost aerial shot. I want to show the freighter-filled Bosphorus and its Golden Horn inlet, the teeming Galata Bridge with lumbering commuter ferries churning up the port, and a huge mosque in the foreground. We go to the spot I envision (above the "New Mosque," near the famous Spice Market) and survey the zone. A restaurant has a shaded roof terrace — we go there and it is perfect…except no necessary sun is shining on me. Next door, a toy company has offices with a small rooftop terrace in the sun. It's perfect. They welcome our crew onto their roof, bring us tea, and — grabbing a calm moment between the gusts — I deliver my lines. Then we taxi to Ortaköy, a trendy café district at the edge of town. It's too far away for tourists, but it sits in the shadow of a Baroque mosque and the mighty modern bridge that crosses the Bosphorus. When the sun is low and the chop of the Bosphorus carbonates the scene, I step out onto the ferry landing. Behind me, the frilly mosque softens the harsh lines created by the mighty bridge as it reaches for Asia. Just as a ship enters the frame, I look into the lens and close the show: "Like its bridge, Istanbul brings East and West together. With a complex weave of modern affluence, Western secularism, and traditional Muslim faith, it's a dynamic and stimulating city, well worth a visit." The next day, I'm sitting in a taxi heading for Istanbul's Atatürk Airport. Driving along the coast, I scan the Bosphorus. A hundred freighters fill the sea — a commotion of ships reminding me of the size of the D-Day landings. Each is filled with cargo for thriving economies. One by one, they enter this maritime bottleneck. In the middle of the strait there's a construction site — an industrial-strength pontoon island with heavy machinery digging down and then out. Istanbul is well on the way to constructing a tunnel under the Bosphorus. I trace the city's horizon with its misty minarets spiking up from the old town to the distant skyline where there is a wannabe-Shanghai forest of modern skyscrapers that the tourist never visits. Reaching the airport, I tip the taxi driver, selfishly holding back just enough change for a coffee. Enjoying a rare break with my iPod, I listen to Amy Winehouse while immersed in the sea of traveling people at the airport. I find I can appreciate the human drama of a crowded public scene better with music-pumping earphones obliterating the natural sound. An old woman weeps as the security line slowly swallows up her son, who's holding a reaching grandson in his arms. Water and shoes are okay here — but my watch and belt need to come off. With a thump, my passport is stamped and shortly I'm out of Istanbul.